Jul. 17, 2017 10:00 a.m.
Four families in Lacombe are now embarking on the experience of being homeowners in the community. On July 14th, four local families – thanks to Habitat for Humanity – received keys to their brand new homes in the Shepherd Heights district. Habitat for Humanity Red Deer, along with the City of Lacombe, completed construction of two new duplexes after 500 hours of volunteer community service from each of the four selected families, and with the assistance of an additional 223 volunteers devoting an incredible 3,500 hours, according to a release. To mark the occasion, partner families, volunteers, donors and various community stakeholders gathered at the site of the new homes for a key ceremony. In attendance were local and regional dignitaries including MLA Ronald Orr and City of Lacombe Mayor Steve Christie. Habitat Red Deer Chairperson James Wright and new CEO Karen Vavrek greeted and acknowledged the individual contributions and celebrated the new beginnings for the Habitat families. “I’m very excited – this is always the most inspiring part of what we do at Habitat, and it’s wonderful to have so many join us in this celebration,” said Vavrek. “Welcome to all of our Habitat families, our community partners, honoured guests and friends. We gather today in the beautiful City of Lacombe to celebrate our second consecutive Habitat key ceremony,” she said. “We hope you’ve had the opportunity to tour around these remarkable homes – and witness first hand the end result of many dedicated and willing hands working together. It’s truly incredible what can be accomplished with community coming together for such a worthwhile endeavour. “To our valued volunteers, donors, staff and community partners – we are amazed by you. For all of your hard work and efforts over the these past 11 months. 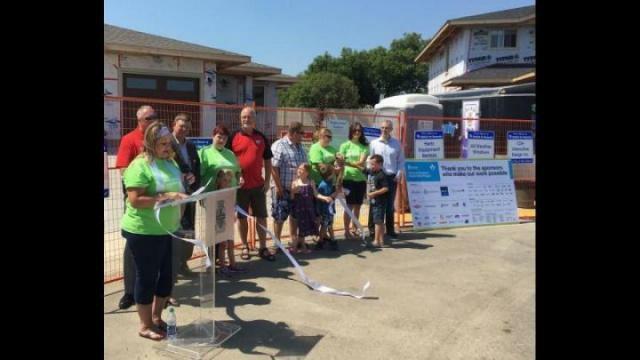 This will mark an end to the construction for the second consecutive project by Habitat for Humanity Red Deer Region in the City of Lacombe. Two other duplexes were previously built in the City in 2016. “On behalf of City council, I congratulate the recipient families on their new homes, and I extend many thanks to all the volunteers and donors for their efforts in helping to build a better future for hard-working families,” said Christie. “We look back to 2010 in our Strategic Plan, and one of our goals was to have strategic partnerships. And this is definitely a strategic partnership,” he said. “It’s worked out way better than anyone could have imagined. “To have not only Habitat for Humanity as a strategic partner, but each and every business from Lacombe and Central Alberta that put a lot of time and effort into this as well, it makes me proud to be mayor of a city where these types of projects are supported so well by not only our business community, but also by our volunteers. I brag about our volunteers wherever I can, whenever I can and how ever I can,” he added. “And they keep proving me right everywhere I go. Jancee Hawthorne, mother of four and one of the recipient families, described the impact of working towards and achieving home ownership. “Well, it means that I can breathe again. It means independence. It means I have a home, a place for my children to gather and share memories and traditions and birthdays and Christmas and life milestones. Orr noted that it was, “A great day – any day that someone gets a new home – it’s truly a great day in Lacombe. And what a great way to celebrate Canada 150 with the Habitat for Humanity goal of 150 homes for Canadians,” he said. “It’s a great way for us to commemorate what we value in Canada and what is important to us – that we care for each other and that we have safe places to live. Especially in a country that has real winters – not every day is as beautiful as today,” he added with a smile. “The Government of Alberta has partnered with a commitment of 75 new homes across Alberta this year,” he said of the province’s partnership with Habitat for Humanity. “I just want to thank and congratulate the local community leaders, volunteers and the sponsors and those who are donors who have made this a reality for our particular community,” he said. ￼￼￼￼￼￼￼￼￼￼￼￼￼￼￼￼￼￼￼￼￼￼Habitat for Humanity mobilizes volunteers and partners to build simple, decent housing in order to provide low-income, working families with access to affordable homeownership.